Are the ViceVersa PRO Downloads and Installation Files Safe? Can I Use ViceVersa to Backup ACT! Files? Can I Use ViceVersa to Copy Files That Are 'In-Use', Such as PST Files and Databases? 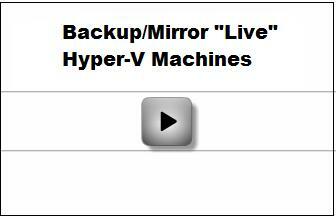 Can ViceVersa Backup Hyper-V Virtual Machines? Can ViceVersa Be Set Up for Scheduling? Does ViceVersa Handle Path Names Longer Than 259 Characters? Does ViceVersa Synchronize Outlook Files (.PST)? Does ViceVersa Work on Windows Server 2003? Does ViceVersa Work on Windows Server 2008? Does ViceVersa Work on Windows Server 2012? Does ViceVersa Work on Windows Server 2016? Does ViceVersa Work with CD-R/CD-RW/DVD-RW Drives? How Do I Apply a File Filter to a Specific Source/Target Pair? How Does ViceVersa Know Which Files Are Newer and Which Files Are Older? How to Avoid Time-Consuming Rescanning of Source and Target Folders? Sometimes Windows Assigns Different Drive Letters to My USB Devices. How Do I Instruct Windows To Always Assign the Same Drive Letter? What Are the Main Differences Between ViceVersa PRO and ViceVersa PLUS? What Happens If the Connection Drops During Synchronization, Backup or Replication? What is a File Conflict? Which Operating Systems Are Supported by ViceVersa? Will ViceVersa Work Over Any Connection Between Two Computers? After Purchase, When Do I Receive the Registration Key? Can I Try ViceVersa Before I Buy? How Do I Buy / Order ViceVersa? How Do I Enter the Registration Information in ViceVersa? How Does 'Try-Before-Buy' Software Work? How Much Does ViceVersa Cost? I Ordered, but I Have Not Received My Registration Key. Fix VVScheduler Error: "A Specified Logon Session Does not Exist"
I Get 'Exit Code 2, the system cannot find the path specified' when Running ViceVersa from VVScheduler. Why? Why Outlook OST files do not copy on Windows Vista, when using VSS Volume Shadow Copies? [VVLauncher] Installing VVLauncher as a Service, I Get the Error that VVLauncher Cannot Access a Network Drive. Why? [VVLauncher] Why Do I Get a 'Cannot Monitor Folder' Error When Running VVLauncher as a Service? 02. What Are the Requirements to Run VVEngine? 03. Which Browsers are Supported by VVEngine? 04. How Do I Install VVEngine? 05. Does VVEngine Start Automatically Every Time I Start Windows? 06. What Ports and Protocols Does VVEngine Use? 07. Can I Connect to VVEngine from a Remote Computer? 08. Can I Use VVEngine to Run Profiles Manually? 09: How Do I Use VVEngine to Run a ViceVersa Profile As Soon As a USB Drive Is Inserted? 10. How Do I Use VVEngine to Run a ViceVersa Profile As Soon As the Network Is Accessible? 11. How Do I Run One Profile After Another? 12: What Are the Advantages of Running VVEngine as a Windows Service? 13. How Do I Setup VVEngine as a Windows Service? 14. How Do I Uninstall VVEngine? 15. How Do I Run a Profile Once a Week, on Monday at 2 PM? 16. How Does VVEngine Compare with the Other Scheduling Tools Available for ViceVersa PRO? 18. Can I Restrict Access to VVEngine with a Password? 19. Can I Change the HTTP Port Used by VVEngine? VVEngine Gadget Message: "VVEngine not found or access is denied"
When you synchronize two locations and a file has changed on both sides since the last synchronization, that file will be identified as a conflict by ViceVersa. Since the same file has changed on both sides, ViceVersa does not know which version to keep and which one to overwrite. In this way, all files are synchronized including conflicts, but old conflict files will be renamed with a timestamp and still be kept in the same folder for potential review by the user. Starting with ViceVersa PRO version 3, there is a new option called ‘Use also SHA-256 hash for comparison’. 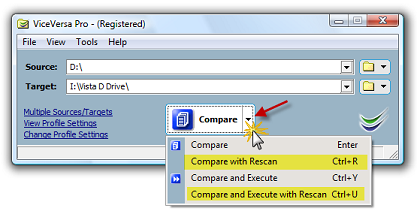 You can use this option with CRC comparison. When this option is enabled, ViceVersa will calculate both the SHA-256 along with CRC32 values during comparison and will use these to compare file contents. Using SHA-256 is more reliable than just using CRC32 to compare file contents, however it is slower. Starting with ViceVersa PRO version 3, there is a new option under Preferences called Install 'File Hashes Windows Explorer Extension'. If you enable this and let ViceVersa install the extension, you will be able to right click on multiple files in Windows Explorer and show their most common file hashes: CRC32, MD5, SHA-1, SHA-256, KECCAK and SHA-3. The extension can be installed and uninstalled easily and quickly from the ViceVersa Preferences as needed. With ViceVersa PRO 3 (or newer) you can move files from Source to Target. The 'Move to Target' option is in Profile Settings -> Execution. This option can be enabled if the Replication (Update Target) method is selected. * All files/folders in Source that are not in Target will be moved to Target (e.g. they will be copied to Target and then deleted from Source if the copy is successful). * All newer files in Source are moved to Target to overwrite older files in Target (e.g. if a file is newer in Source, it will be copied to Target and then deleted from Source if the copy is successful). * If a Source file has a matching Target file already, it is not copied, but the file is deleted from Source because it is already in Target. It is also possible to move only specific files based on file filters, such as the file size, name, extension or date/time. Starting with ViceVersa PRO version 3, a new option called “Minimize Memory Usage” has been added to the profile settings (under Performance). Enabling this option will result in a much lower memory usage by the profile: memory usage will be almost halved. This new option is useful when dealing with a lot of files in a profile, e.g. more than one million, as a guideline. Note that folder comparison will be marginally slower when this option is enabled. ViceVersa PRO always had the option to copy file and folder security attributes (permissions, ownership and optionally auditing) when a file or folder is copied between NTFS file systems. Starting with ViceVersa PRO version 3, security attributes can now be replicated also for existing files, that is files that are already both in Source and Target and do not need to be copied again, and for files where only security attributes have changed since last replication/synchronization. This new option is called ‘Recheck file / folder security during comparison’. When this new option is enabled, ViceVersa will re-check and re-align the selected security attributes for all files and folders in Source and Target. This means that the selected security attributes will be re-checked during comparison and will be re-adjusted during profile execution, and not only for files and folders that are copied but also for files and folders that are already both in Source and Target and for which only security attributes have changed. Furthermore, VVEngine is able to detect changes in only security attributes, when working in real-time, and will replicate them if they change (without copying the file again, if the file hasn’t changed, only the security attributes). Note that when only security attributes have changed for a file, then the security attributes are always copied from Source to Target, never from Target to Source. Microsoft Azure Files offers fully managed file shares in the cloud that are accessible via the industry standard Server Message Block (SMB) protocol (also known as Common Internet File System or CIFS). Azure File shares can be mounted concurrently by cloud or on-premises deployments of Windows, Linux, and macOS. Shared access. Azure File shares support the industry standard SMB protocol, meaning you can seamlessly replace your on-premises file shares with Azure File shares without worrying about application compatibility. Being able to share a file system across multiple machines, applications/instances is a significant advantage with Azure Files for applications that need shareability. Fully managed. Azure File shares can be created without the need to manage hardware or an OS. This means you don't have to deal with patching the server OS with critical security upgrades or replacing faulty hard disks. Scripting and tooling. PowerShell cmdlets and Azure CLI can be used to create, mount, and manage Azure File shares as part of the administration of Azure applications. You can create and manage Azure file shares using Azure portal and Azure Storage Explorer. Resiliency. Azure Files has been built from the ground up to be always available. Replacing on-premises file shares with Azure Files means you no longer have to wake up to deal with local power outages or network issues. Once the file share in the Azure cloud is created, it can be used locally as a standard disk/folder share by all applications including ViceVersa and VVEngine. The share will behave like any other network share on the LAN: ViceVersa will be able to synchronize/replicate files from/to the share and VVEngine will also be able to monitor for file changes on the share and synchronize/replicate files in real-time. Multiple PCs and servers will be able to sync/replicate files from/to the Azure share in the cloud. Azure Files will provide the secure and reliable file storage in the cloud, accessible as a standard share and mappable as a local drive letter. Importantly without the need to administrate or setup a new server or virtual machine. ViceVersa PRO and VeraCrypt are fully compatible. Once the VeraCrypt container is created and mounted, you can use it as a Source or Target in ViceVersa. ViceVersa PRO is fully compatible with mounted Windows Virtual Hard Disk Files (VHD). Once the Virtual Hard Disk File is created and mounted, you can use it as Source or Target in ViceVersa PRO. The Virtual Hard Disk File will act as a single file container. Lightweight and not “bloatware” (our downloads are only a few megabytes). Digitally signed by TGRMN Software for extra security and guarantee. Only install the software that is actually downloaded, ViceVersa PRO or VVEngine, no additional/other unwanted software. Do not change or alter system-wide settings, including registry, system files or other operative system settings. Do not affect the functioning of the operative system or other running programs. Do not install any Windows Services (unless explicitly requested when setting up the VVEngine to run as a service). Only install and copy files to the designated installation folder. Do not require a system reboot after installation. Self-contained and do not require any third party components or libraries to run. Can be uninstalled cleanly and quickly if needed, without leaving any traces or system changes behind. Do not communicate “back home” any information at all. TGRMN Software has been selling ViceVersa PRO and VVEngine since 2001, you can trust all our products. You can download ViceVersa PRO and VVEngine with confidence. Please visit our User’s Forum to discuss with other users. Please contact sales@tgrmn.com for any questions or clarifications. Starting with ViceVersa PRO version 2, the Volume Shadow Service is used to copy files and databases while they are in-use or locked. See http://www.tgrmn.com/web/kb/item33.htm for more information. Yes, ViceVersa PRO can backup Hyper-V virtual machines using the new Windows Hyper-V Volume Shadow Copy Service (VSS) Writer. (a) From within the Hyper-V virtual machine (guest-based backup). In this scenario, ViceVersa PRO runs within the virtual machine to backup files. This is the same process you would use to backup files on any other operative system. (b) From the Hyper-V host (host-based backup). In this scenario ViceVersa PRO runs on the host computer (outside the virtual machines) and uses the Hyper-V VSS Writer to backup the virtual machines. Using this method is recommended, because it captures more data. This type of backup includes the configuration of virtual machines and virtual networks, snapshots associated with the virtual machines, and all the virtual hard-disks used by the virtual machines. The virtual hard-disks contain the entire guest operative system, Windows Registry, and any data or applications installed in the guest. This method allows so-called “baremetal restore” of the Hyper-V virtual machines. 1) Use the Windows Task Scheduler and the ViceVersa Command Line (ViceVersa PRO and PLUS). Command line options for ViceVersa are documented in the help file. 2) Use VVScheduler (ViceVersa PRO). VVScheduler is included in the ViceVersa PRO download and can be accessed from the 'Tools' menu. VVScheduler can schedule multiple profiles to run periodically at a certain time. 3) Use VVLauncher (ViceVersa PRO). VVLauncher is included in the ViceVersa PRO download. VVLauncher can schedule one profile at a time and can run it as soon as file changes are detected in folders. It is quite rare to exceed 259 characters for a file path name. If that is needed, ViceVersa PRO supports long path names exceeding 259 chars. To enable this in a specific folder use the prefix "\\?\". For example, to allow paths longer than 259 characters in c:\folder\backup\ use \\?\c:\folder\backup\ as source (or target, or archive folder) in ViceVersa PRO. Using "\\?\" permits a maximum path length of approximately 32,000 characters composed of components up to 255 characters in length. To specify a UNC path, use the "\\?\UNC\" prefix. ViceVersa treats Outlook Files (.PST) as any other file. When synchronization is activated, ViceVersa overwrites the older PST file with the newer PST file, based on the files' timestamps. If changes have occurred in both PST files since the last synchronization (e.g. you have worked on both computers where Outlook is used, without synchronizing first), then a conflict is reported. The conflict pair needs to be resolved manually, i.e. you need to decide which file to keep. Please note: ViceVersa does not synchronize individual Outlook e-mails, contacts, appointments. Yes. ViceVersa PRO is fully compatible with all editions of Windows Server 2003. Yes, ViceVersa PRO is fully compatible with Windows Server 2008 (and with Windows Server 2003, 2000). ViceVersa PRO is fully compatible with all editions of Windows Server 2008: Standard, Enterprise, Datacenter, etc. ViceVersa is not compatible with the Windows Server 2008 Server Core mode as ViceVersa requires a GUI to be present. ViceVersa PRO can run on the server as a Windows Service using the VVEngine add-on. Yes, ViceVersa PRO is fully compatible with Windows Server 2012 and Windows Server 2012 R2. ViceVersa PRO is fully compatible with all editions of Windows Server 2012 (Essentials, Standard, Datacenter, etc.). ViceVersa is not compatible with the Windows Server 2012 Server Core mode as ViceVersa requires a GUI to be present. ViceVersa PRO can be easily setup to run as a Windows Service using the VVEngine add-on. Yes, ViceVersa PRO is fully compatible with Windows Server 2016. ViceVersa PRO requires Windows Server 2016 with Desktop Experience installed. It does not run just on Server Core as it needs the GUI to be available. Yes, ViceVersa works with CD/DVD Recordable/ReWritable drives (CD-R/CD-RW/DVD-RW) if a proper device driver is installed and configured with your drive. The driver should make the CD/DVD behave like a large floppy disk. Nero InCD (part of Nero 6 or later) and Roxio DirectCD (part of Easy Media Creator) are two products that work with various CD/DVD drives and makes them look like large floppy disks. Check with your CD/DVD documentation. One simple test to see if ViceVersa will work with your drive is to see if you can copy files from your hard disk to the drive using Windows Explorer. If Windows Explorer can copy files to the drive ViceVersa can too. Note on Windows XP: Windows XP includes a "lite" version of Adaptec/Roxio's Easy CD and it does not make the CD-R/RW/DVD-RW look like a hard disk. You will need to install a packet writing software such as Roxio's DirectCD for Windows XP. DirectCD is included with Easy Media Creator for Windows XP. DirectCD allows your drive to appear just like any other drive volume. In other words, your CD-R/RW/DVD-RW drive handles files just like a hard disk or floppy disk. Once you have Direct CD installed on your system, you can drag and drop files to the CD/DVD as well as use ViceVersa to backup your files to the CD-R/RW/DVD drives. I have a profile with multiple source/target pairs: how do I apply a file filter only to one of the pairs? For instance, I would like to include all .doc files, but only from the second pair. The notation <2> will limit the scope of the filter to the second source/target pair. Similarly, use <1> for the first pair, <3> for the third, etc. ViceVersa uses the timestamp that Windows assigns to every file. To identify file conflicts, i.e. files that have changed both in source and in target, and to keep track of file deletions, ViceVersa PRO uses a tracking database. Every time you run a project/profile, ViceVersa compares the files in source and in target to see if they have changed. By using the file timestamp assigned by Windows, ViceVersa determines which files are identical, which files have changed and which files have been added or deleted. Then, based on the execution method you specify, ViceVersa will copy and delete files as required. For example, you can specify Synchronization or Backup or Replication as execution method. ViceVersa will save you time and network usage by only copying files when necessary. ViceVersa powerful preview feature shows you exactly what is going to happen before any files are touched. Preview even gives you the possibility to copy/delete individual files and to reconcile file conflicts. ViceVersa PRO can also be scheduled using VVScheduler or run at Windows' start-up, shut-down or as soon file changes are detected using VVLauncher (included in the ViceVersa PRO download). I have setup a ViceVersa profile to copy files between multiple computers (they are all servers). It is working fine. However when I create a test file and save it to a local folder (the source) that is in the profile, it takes a while to get around to the other machines even though I have the profile set to update immediately as soon file changes are detected. I'm concerned about this, because the root folder in this profile contains 10GB of data and if I save just one file it runs the entire profile to update (it rescans the entire source and target folders). What can be done to avoid this and avoid using too many resources? You can use the new file or subfolder level change detection functionality in VVEngine Server Premium. The new file or subfolder level change detection functionality does not require a full re-comparison of source or target and this speeds up execution substantially, especially over slow connections or with a large amount of files. VVEngine will keep track of which files have changed, are new or have been deleted, and when the profile runs it will apply changes to the other side without performing a full rescan. To have ViceVersa use the native CopyFileEx Windows API when copying files, enable the option Use Windows native file copy in ViceVersa profile settings -> performance / options. With this option enabled, ViceVersa will use offloaded data transfer capabilities if they are available. Go to Control Panel ->Administrative Tools -> Computer Management. Select the drive you just inserted and right-click. From the context menu that appears, select the option to change the drive letter. In the "Change Drive Letter" dialog, select an available letter for the drive. From now on, every time you insert the USB drive, Windows will assign the same drive letter you specified. When ViceVersa overwrites an older file with a newer file, first it copies the new file to a temporary file in the destination folder. Only after the copy operation completes successfully, ViceVersa replaces the older file with the temporary file. So, in case of a connection failure only the temporary file is affected. Just run ViceVersa again when the connection is restored, the temporary file will be removed. During file synchronization a file conflict occurs when a file has changed in both locations (source and target) since the last sync, making it difficult to determine which version should be left unchanged and which version should be updated. For example, if you've changed a document on your desktop computer since the last synchronization and also made a different change to the same document on your laptop, a file conflict will occur. ViceVersa PRO (ViceVersa Plus does not track file conflicts) will mark file conflicts in the comparison window with a ** in front of the name and will also report conflicts in the log file and the scheduler, so that you can decide which version you want to keep and which version you want to update. There is a profile option in ViceVersa PRO to 'Synchronize files even if in conflict (synchronization method)'. When this option is enabled, ViceVersa PRO will synchronize also file conflicts: it will copy the newer file over the older file and rename the older file into filename_[timestamp]_CONFLICT and keep it in the same folder. In one-way sync, files are copied only from a primary location (source) to a secondary location (target) in one direction, but no files are ever copied back to the primary location. Replication and Backup (=Mirroring) are one-way sync methods in ViceVersa. In two-way sync, ViceVersa copies files in both directions, keeping the two locations in sync with each other. Synchronization and Consolidation are two-way sync methods in ViceVersa. You might set up a one-way sync to backup your files to the network, for example, where ViceVersa will copy every new files from your computer to the network but never to copy files in the other direction (from the network to your computer). When files are deleted from your computer they are also deleted from the network. You might set up a two-way sync between a desktop and a laptop computer, for example, where ViceVersa will copy the newest version of any file it finds to the other location, overwriting any older versions of the same file. This is a good way to sync if you work with the same files on both computers and want to make sure you always have the most recent version of every file you have worked on, no matter which computer you are using. During a two-way sync, ViceVersa will alert you whenever it finds a conflict, which typically occurs when a file has changed in both locations since the last sync. Rather than overwrite either of the files that have been updated since the last sync, ViceVersa will show the conflict and you can decide which version to keep. There is also a profile option in ViceVersa PRO called 'Synchronize files even if in conflict (synchronization method)'. When this option is enabled, ViceVersa PRO will synchronize also file conflicts: it will copy the newer file over the older file and rename the older file into filename_[timestamp]_CONFLICT and keep it in the same folder. For other operating systems such as Unix, Linux or Netware, as long as the machines running these platforms are visible to the Windows machine, ViceVersa PRO can synchronize and replicate files. ViceVersa PRO must run on one of the supported operating systems listed above. Windows XP (32-bit). Note: ViceVersa PLUS is no longer updated. It is recommend that you download ViceVersa PRO instead. The PLUS version will be discontinued soon. Yes, when you can "see" the source and target folders using Windows Explorer and you can manually copy/move/delete files between the two machines. ViceVersa will have no problem in synchronizing or mirroring the folders. The type of connection is not important. This includes connections such as LAN, WAN, VPN, Bluetooth and also storage media such as external Hard Disks, Network Disks, USB Disks, Zip Drives, USB Keys, CD-R, CD-RW, DVD, etc. Backup programs are designed to backup files. To "backup files" is to make copies of files (replication) and store them on a separate media to be used in case the primary files are lost or corrupted. ViceVersa replication and archive features are designed to create secure backup copies of files and folders. Backups are essential for all work. For important work, two or three backup sets are advisable. To be especially safe, backup sets should be kept in different locations. Backup files can be stored compressed and/or encrypted to save space. CRC is the acronym for Cyclical Redundancy Checking. It is a type of algorithm known as a "hash". A hash algorithm accepts variable-length input and produces a fixed-length output which uniquely represents the input data. The hash is usually much shorter in length than the data it represents. A sample CRC value for a file could be ADE50E9F. In theory, no other file should produce the same hash value. ViceVersa calculates the CRC value of one file and compares it to the CRC of the corresponding file in the other folder. If the CRCs differ, the files differ. The CRC algorithm is widely used in network protocols and compression programs. During File Synchronization, File Replication, File Mirroring or File Backup, older files are overwritten by newer files or they are deleted if their counterpart has also been deleted. ViceVersa PRO enables archival of former versions of files which are changed or deleted. This is called the File Archiving feature. By using File Archiving, when a file is overwritten or removed during a run, the old file is first moved to an archive location, locally or over the network. Files moved to the archive location maintain the original timestamp. The timestamp of when they were moved is also encoded in the file name. Hence, multiple versions of files can be kept for a specified period of time. Extensive options in ViceVersa lets you to control how many versions of each file to keep, where and for how long: you can specify to keep old versions for X days, or up to X copies, or only for certain file names or extensions. ViceVersa PRO also features an archive viewer tool that lets you browse the archive locations and visualize all the archived file versions. With ViceVersa PRO, files in Source and/or Target folders can be compressed to save space. For example, when backing-up from a PC/Server to an external USB drive, ViceVersa PRO can keep the files on the USB drive compressed. Each file on the USB drive is compressed using the GZIP format. Optionally files can be moved from Source to Target, where the source file is deleted after copy. For more information see File Synchronization. Synchronization is an adjustment that causes something to occur or recur in unison. Specifically, File Synchronization is an adjustment to files between two (or more) locations with the goal of making sure that the locations contain the same up-to-date files. Locations can be folders on LAN, WAN, VPN, USB drives, USB keys, CD-RW, Zip Disks, etc. Using this definition File Replication and File Mirroring (Backup) can be classified as special synchronization methods. This method performs a bidirectional file synchronization between Source and Target. This method backs-up Source to Target by creating a mirror/replica of the Source in Target. This method performs consolidation between Source and Target. This method does not keep track of file conflicts nor file deletions. File Verification is the process of verifying that a file has not been changed and/or that two files are identical, bit by bit. ViceVersa supports both types of file verification. You can verify that files in a specified location have not changed by creating a snapshot of one or more folders at a given time and then re-comparing the folder content with the original snapshot at later time. You can also verify that two locations have exactly the same files, bit by bit: ViceVersa will calculate the CRC of each file to make sure they are indeed identical. A very important and common task for people working with CD creation is the verification that the data mastered is the same as the original data. For this purpose ViceVersa offers a Cyclical Redundancy Check. With ViceVersa you can determine if even one byte of data differs. Starting with ViceVersa PRO 3, SHA-256 hash file verification can be used alongside CRC. Starting with version 2.5 build 2507, ViceVersa PRO offers the option to perform an “unbuffered file copy” when copying files. The new option is in profile settings -> performance. What is unbuffered file copying? The standard file copying (the default in ViceVersa) caches file reads and writes in the file system memory. This speeds up file reads and writes, but it has an associated memory cost that may impact other applications/processes running on the system while file copying is proceeding. Especially for large files, the memory cost may be significant. Unbuffered file copying does not cache file reads and writes in the file system memory. It is moderately slower, but it minimizes memory usage. Unbuffered file copying is preferred when copying large files or a large amount of files without impacting the system memory. The new option Unbuffered file copy is available in ViceVersa PRO starting with version 2.5 build 2507. This option is supported on Windows 10, 8 / 8.1, 7, Vista, Windows Server 2008, 2012, 2016 or newer. It is not supported on Windows Server 2003, Windows XP, 2000 or older. After we receive your online credit card order and the charge is authorized, you will receive an e-mail with the Registration Key. Most transactions are immediate, however it may take a few hours to authorize the transaction in some cases. In the unlikely event that your credit card is declined, you will receive an e-mail stating the reason for this. If you do not receive any e-mail within 24 hours, please contact us at sales@tgrmn.com with your name and the approximate date and time of your order to obtain the status of your order. The Registration Key is sent via e-mail once the payment is received. Yes, you can download ViceVersa for a free 30-day trial. The trial download is fully functional. After the trial period ends, you will need to purchase one or more licenses. If you do not wish to purchase after evaluation, the included uninstall routine will completely and cleanly remove ViceVersa from your computer. You can order ViceVersa from our website paying with Credit Card, PayPal, Check, Wire Transfer, ACH and more. When we receive your order, we send you a Registration Key via E-mail. You then enter the Registration Key in the ViceVersa trial that you have already downloaded and installed on your computer. ViceVersa will unlock and become registered in your name. Once you have received the registration information from us, you will need to enter it in ViceVersa. The easiest option is to copy and paste the information directly from the e-mail. 3. The "Enter Registration" dialog box will open. Paste the two values into the corresponding fields in ViceVersa. * Sometimes the registration text may span across 2 lines of E-Mail. In that case you need to merge and copy both lines. * In ViceVersa Plus the "text" field is called "name". * Make sure that you enter the code in the correct version of ViceVersa. If you purchased ViceVersa Plus the code is only valid for the Plus version, if you purchased ViceVersa Pro the code is only valid for the PRO version. For further queries, please contact support@tgrmn.com and include your registration text/key, the error code returned and any relevant order detail information. 'Try-before-buy' software allows you to evaluate applications such as ViceVersa to see if they suit your needs. You can try the fully-functional ViceVersa for free for 30 days. After this trial period, if you wish to continue to use ViceVersa, you must place an order for the number of licence(s) you require. We then send you the Registration Key via e-mail that you can enter in ViceVersa to unlock the program. There is no need to download or install additional software. A ViceVersa PRO license for Windows 10, 8.1, 8, 7, Vista, XP, 2000 costs $59.95 (US$). A ViceVersa PLUS license for Windows XP costs $34.95 (US$). A ViceVersa PRO server license for Windows Server 2016, Windows Server 2012 (R2), Windows Server 2008 (R2), Windows Server 2003 (R2), Windows 2000 Server, Windows Home Server, Windows Small Business Server (SBS) costs $179.95 (US$). Each server participating in the synchronization, backup, replication requires its own server license. A server PREMIUM license with extended VSS support costs $249.95 (US$). See Buy Page for all pricing options, including multi-license discounts. When you order online via our secure server, your key is automatically generated and sent to the e-mail account that you specified on the ordering form. Usually this takes a few minutes, sometimes up to 1 hour. You entered your "other" e-mail account when you ordered. Your spam filter killed the e-mail. You have a spam blocking service and the e-mail with code is stuck in a queue somewhere. You can also contact us at sales@tgrmn.com. We will be happy to re-send your registration key. We accept all major Credit Cards: Visa, MasterCard, American Express, Diners Club, Discover, JCB, etc. Your order will be fulfilled by Digital River MyCommerce, a leader in digital commerce. Your order is fully guaranteed. Save the ViceVersa PRO E-Mail Script to your ViceVersa "GlobalScripts" folder, under the ViceVersa PRO 2 installation folder (usually 'C:\Program Files\ViceVersa PRO2\GlobalScripts'). If you do not have the GlobalScripts folder, you need to update to the latest version of ViceVersa PRO 2. Open the script with NotePad. Activate the option "Run custom scripts after execution" in the advanced profile settings for all the ViceVersa PRO profiles you want to receive an e-mail for. By default the script will send an email only if an error occurs. You can change this default behavior by setting the variable SEND_EMAIL_ONLY_IFERROR to FALSE. Then the script will always send an e-mail at the end of a profile execution. You need ViceVersa PRO 2 Build 2011 or newer for this script to work. The following is an example of an e-mail sent by the script. Since Version 2, Build 2011, ViceVersa PRO supports local and global scripts. Scripts can be setup to run before and/or after a profile execution. Typically scripts before profile execution are run to prepare the computer environment. For example, mapping a network drive or connecting to a network resource. Instead, scripts after profile execution are run to disconnect from the network or to report, e.g. via e-mail, the results of a synchronization or a backup. Scripts can be global (a global script is run for all profiles) or local (a local script is only run for one profile). If you need to define multiple start scripts, the first script must be called 'global_start.ext', the second one 'global_start_1.ext', the third one 'global_start_2.ext' and so on, up to a max of 9. Same mechanism for the global end scripts: the first must be called 'global_end.ext', the second one 'global_end_1.ext', the third one 'global_end_2.ext' and so on, up to a max of 9. Once you have created and placed your global scripts in the GlobalScripts folder, you will need to activate the option "Run custom scripts before comparison" and/or "Run custom scripts after execution" in the profile settings for the profiles you wish to run the scripts for. If you do not activate these profile options, the profile will not run the global scripts before and/or after execution. Also for running local scripts, you will need to activate one or both the options "Run custom scripts before comparison" and "Run custom scripts after execution" in the profile settings for the profiles you wish to run the local scripts for. Self-Monitoring, Analysis, and Reporting Technology, or S.M.A.R.T., is a monitoring system for computer hard disks to detect and report on various indicators of reliability, in the hope of anticipating failures. More information. The batch file downloadable on this page can be setup to run BEFORE a ViceVersa profile and if the S.M.A.R.T. check reports an issue with the computer hard disk's health, it will abort profile execution. This prevents files from being corrupted. Inside the smart.zip file, open and read the file install.txt which contains the installation instructions. Script output is redirected to the ViceVersa profile log (if a log file for the profile has been setup). You are able to check the script output by looking at the ViceVersa profile log. If any of the scripts that run before profile execution return an exit code different from 0, the execution is canceled and the ViceVersa profile does not run. Scripts have access to some ViceVersa variables by means of Environment Variables. ViceVersa PRO makes the following variables available. In addition to the above variables, ViceVersa PRO 2 Build 2014 (or newer) also supports the following variables. VV_RUN_SUMMARY = A summary of the files copied or deleted. In addition to the above variables, ViceVersa PRO 2 Build 2015 (or newer) also supports the following variables. ViceVersa PRO 2 Build 2011 (or newer) supports Global Scripts. Global Scripts run before and/or after profile execution. Global Scripts can be Visual Basic scripts (*.vbs), Batch Files (*.bat, *.cmd) or Java Scripts (*.js). Global Scripts must be located in the "GlobalScripts" folder under the ViceVersa PRO installation folder; usually 'c:\program files\ViceVersa PRO2\GlobalScripts'. Once you have created the global script(s) in the GlobalScripts folder, you need to activate the option "Run custom scripts before comparison" and/or "Run custom scripts after execution" in the profile settings, for the profiles you want to run the scripts for. Some of the profiles may stop with “out-of-memory” or "Windows heap depletion" errors. Some of the profiles complete, however without copying any files (this may happen only in versions before 2.5 build 2503). This behaviour may occur if the Windows desktop heap (when VVEngine is running as a standard program) or the non-interactive heap (when VVEngine is running as a Windows Service) in the WIN32 subsystem is depleted. Windows Heap depletion can happen because other programs / services in addition to VVEngine may be using the memory allocated in the Windows Heap. a) Limit the amount of profiles that are running concurrently by scheduling them to run at different times. 4.From the Edit menu, choose String. Increase the zzzz value to "1024". Note: Microsoft also provides a tool that can do the above steps automatically. The tool can be found at http://support.microsoft.com/kb/126962 or at http://support.microsoft.com/kb/947246 for Windows Vista, 7, 2008. This error does not happen when you run ViceVersa manually by clicking on "Compare". This can occur if you are working with a mapped network drive. Drive mappings may not be available when a scheduled task runs even if you set up the task to log in with your user name and password. - Set up the folders as UNC paths rather than mapped drive letters, e.g. \\server\share\, or remap the network drive in the ViceVersa PRO profile settings (profile settings -> folders -> network). Mapped network drives do not work in scheduled tasks, unless you explicitly map them before running the task (see note 1 below). Regardless, they may still fail for a number of reasons. If you plan to schedule a ViceVersa profile to run in VVScheduler, VVLauncher or VVEngine (or on the command line), make sure you use the UNC network path directly in the ViceVersa profile, instead of the mapped drive. If you need to provide a user / password combination to access \\ComputerName\Share\ , you can enter that information in the ViceVersa profile: profile settings -> folders -> network. Note 1: It is possible to re-map a network drive in ViceVersa -> profile settings -> folders -> network. This requires ViceVersa version 3 or newer. When comparing very large file data sets (many terabytes), ViceVersa PRO could get stuck on 'Comparing Done'. This issue has been fixed in ViceVersa PRO 2.5 build 2517, released in May 2016 (or newer). If you experience slow file deletion by ViceVersa when running on Windows Vista, it is most likely caused by sending files to the Recycle Bin. The solution is to disable the option to send files to the Recycle Bin when deleting. The option is accessed from the ViceVersa main menu -> view -> preferences. "Can not open outlook.ost. The file could not be located." This is by design in Windows Vista. Windows Vista Volume Shadow Copies do not include Outlook OST files. << Maintaining changes to .ost files within shadow copies is expensive in terms of space and I/O activity. The performance impact doesn’t occur during the image backup itself--the only extra work at backup time is backing up the .ost file as part of the image. Instead, the performance impact occurs during the ongoing, everyday I/O to the .ost file when Outlook is running. If the .ost changes were kept in shadow copies, then every time Outlook writes to the .ost file, the result is a copy-on-write I/O hit (2 writes, 1 read). Although we have worked to reduce the impact of copy-on-writes on shadow copies, a heavily churned file like an .ost file could still cause problems. For these reasons, and the fact that .ost files can be regenerated, we chose to delete .ost files from the shadow copy before the image is created. Hence, OST files cannot be copied with ViceVersa PRO using VSS Volume Shadow Copies, on Windows Vista. To prevent ViceVersa PRO from reporting this error with OST files and VSS, exclude the OST file from the profile. Add an exclude file filter to exclude the file "outlook.ost", under profile settings -> file filters. - You get the error message: "Can not copy NTFS Additional File Streams ... The request is not supported." The message is shown for some files only. This error message is caused by a problem in Windows Vista and Windows Server 2008, as confirmed by Microsoft. ViceVersa PRO shows an error message when trying to copy files or folders with path longer than 259 characters. The files or folders are skipped. VVEngine shows the error message "The network BIOS command limit has been reached" in Windows Server 2003, in Windows XP, and in Windows 2000 Server. By default the VVLauncher service is installed under the LocalSystem account. The LocalSystem account does NOT have access to network drives. To access the network you need to run the VVLauncher service under a user account which has access to the network drive. Double click on it or click the button "Properties"
Enter the user account and password. Note: Do not use mapped drives to access the network. Instead use UNC paths ( eg \\server\share\ ). Services do not recognize mapped drives. You are probably running the VVLauncher service under the "Local System" account. The "Local System" account does not have access to network resources. This is causing the error. To solve this, run the service under a user account which has access to the network share (you will need to specify proper user name and password). 1) Scheduled tasks in the VVScheduler may show incorrect Next Run Time, Last Run Time, Last Run Result and/or Status. 2) If the option 'Run only if logged' is NOT set in the scheduling properties, then the scheduled task fails to run. 3) Tasks that are set to repeat every X minutes in VVScheduler may fail to run. NOTE: All issues are now solved in the latest ViceVersa PRO 2.5 Build 2519 or newer and Windows 10 Creators Update (version 1703) or newer. Please note that the VVEngine and VVLauncher are NOT affected by these issues. These issues only apply to VVScheduler on Windows 10 Anniversary Update (version 1607). To solve issues 2 and 3, update Windows 10 to Windows 10 Creators Update (version 1703 or newer) and download and install the latest ViceVersa PRO 2.5 Build 2519 or newer. 1) Scheduled tasks may have shown incorrect Next Run Time, Last Run Time, Last Run Result and/or Status. 2) If the option 'Run only if logged' was NOT set in the scheduling properties, then the scheduled tasks failed to run. 3) Tasks that were set to repeat every X minutes in VVScheduler may have failed to run. All issues are now resolved in ViceVersa PRO 2.5 Build 2519 (or newer) download here and Windows Server 2016 with all the latest updates installed as of August 2017. The ViceVersa Folder Snapshot Extension adds some useful snapshot commands to the Windows Explorer folder context menu. Download the installer above to install the extension. To remove the extension simply uninstall. Create Snapshot: This command creates a snapshot file "snapshot.vsn" in the selected folder. The snapshot will contain information about all files and subfolders in the selected folder, including their timestamps. 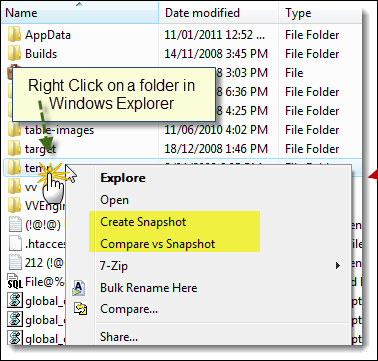 Compare vs Snapshot: This command compares the content of the selected folder (and subfolders) vs. an existing snapshot file "snapshot.vsn" in that folder. ViceVersa PRO will start and show the differences between snapshot and current folder contents. Create CRC Snapshot: This command creates a snapshot file "snapshot.vsn" in the selected folder, including the CRC values for all the files. 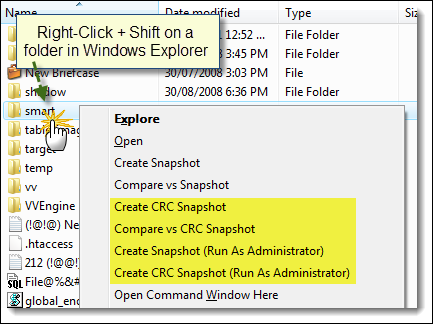 Compare vs CRC Snapshot: This command compares the content of the selected folder (and subfolders) vs. an existing snapshot file "snapshot.vsn" in that folder. ViceVersa PRO will start and show the differences between snapshot and current folder contents, including CRC values. Create Snapshot (Run as Administrator): This command creates a snapshot file "snapshot.vsn" in the selected folder, running elevated as administrator. Create CRC Snapshot (Run as Administrator): This command creates a CRC snapshot file "snapshot.vsn" in the selected folder, running elevated as administrator. VVLogViewer is a tool that makes viewing the ViceVersa log files easy. VVLogViewer can highlight errors and warnings in the log and can quickly jump to lines containing errors, simply by pushing F4. VVLogViewer is free and it is included in the main ViceVersa PRO download. VVEngine is a new add-on for ViceVersa PRO. VVEngine is an advanced scheduler that lets you schedule all your ViceVersa profiles. VVEngine lets you create profile chains and categories to run sequentially. To run VVEngine you need ViceVersa PRO 2 or newer installed (VVEngine is a ViceVersa PRO add-on). VVEngine runs on Windows 10, Windows 8, Windows 7, Windows Vista, Windows XP, Windows 2000, Windows Server 2003, Windows Server 2008 (all editions of these operative systems, including R2), Windows Server 2012 (all editions, including R2), Windows Server 2016 (all editions), Windows Home Server and Windows Small Business Server. VVEngine does not run on Windows 98, Me or 95. VVEngine is a 32-bit application, compatible with both Windows 32-bit and 64-bit. To control VVEngine you need an Internet browser: Microsoft Internet Explorer 5.5 (or later), FireFox 1.5 (or later), Chrome, Opera or Edge. Internet Explorer 5.5 (or later), FireFox 1.5 (or later) or Chrome. At the end of installation, VVEngine will start. You connect to VVEngine with your Internet Browser. Start the browser (e.g. Internet Explorer or FireFox) and type http://127.0.0.1:8001 in the address bar. This unique address opens the VVEngine interface. When you open VVEngine for the first time there will be no ViceVersa profiles scheduled. You can add a new profile by clicking on "Add Profile" on the main VVEngine page. After installation, VVEngine will automatically run in the background each time you start Windows. Yes. Once VVEngine is installed, it will automatically start when you start Windows. If you uninstall VVEngine, VVEngine will be removed and will no longer start when you start Windows. By default, VVEngine uses port 8001 and the HTTP protocol to communicate with your web browser. To connect to VVEngine, type http://127.0.0.1:8001 into your web browser address bar. Yes, you can connect to VVEngine from a remote computer. You will need to change the default VVEngine settings in order to do this, because, by default, VVEngine only allows web browser connections from the local computer (IP 127.0.0.1). Select "Start" > "All Programs" > "VVEngine for ViceVersa PRO" > "VVEngine Settings". In the VVEngine Settings dialog box, enter the IPs that will be allowed to connect to VVEngine in the "Allowed IPs" field. Click on "Apply Changes". VVEngine will restart with the new settings. After this change, to connect from a remote computer, type http://<ip>:<port> into the web browser address bar on the remote computer. <ip> is the IP of the computer where VVEngine is running. <port> is the VVEngine HTTP port, usually 8001. Yes, you can add profiles to VVEngine without them being part of a schedule and run them manually. You do this by clicking on 'Run Profile'. Profiles without a schedule have the text 'Manually' written in the 'Next Run' field. This allows you to organize your profiles into categories and see the profile history for the last 15 runs. Your profile has now been added to the VVEngine list. As soon as all the sources and targets in the profile are accessible VVEngine starts the profile to synchronize, replicate or backup your files. Your profile is added to the VVEngine list. As soon as all the sources and targets in the profile are accessible, VVEngine starts the profile to synchronize, replicate or backup your files. Note: network detection can take a couple of minutes. If you want to start the profile only once an hour, once a day or once a week (i.e. you disconnect and reconnect to the network multiple times but only want the profile to start every hour, day or week) select 'Hourly', 'Daily' or 'Weekly' instead of 'Immediately'. With VVEngine you can run multiple ViceVersa profiles sequentially. Manual Runs: Add the ViceVersa profiles to VVEngine with no scheduling options set and make all of them part of the same category. When you want to run all the profiles in the category, select the category and click on "Run All" in VVEngine. "Run All" runs all the profiles in the current category. Scheduled: Add the ViceVersa profiles to VVEngine. For the first profile, change the schedule and set the "After this profile, run ..." to the profile name of the second profile. Then open the second profile's schedule and set the "After this profile, run ..." to the profile name of the third profile and so on. Note that only the first profile needs to have a schedule set, because the second, third, etc. will run sequentially after the first one. Running VVEngine on a Windows Server as a Windows Service allows you to keep VVEngine running even when no one is logged onto the server. It also allows you to run VVEngine under a different account from the current logged-in account. When VVEngine is installed as a Windows Service, you are still able to control it with a web browser and from a remote machine. Double-click on the file "Service - INSTALL VVEngine as Service.bat" This script will install VVEngine as a service. You will need administrator privileges to be able to do it. Note: this script will stop any VVEngine profiles that are running before installing VVEngine as a service. Open the Windows Service Console. You should now see VVEngine in the list of installed services. After having selected the right account, click on the button "OK" and start the service by right-clicking on the service name and selecting "Start" from the menu. As a service, VVEngine will keep running even if no one is logged onto the computer. You can connect to VVEngine from any computer in the network by typing http://<ip>:8001 into the web browser address bar. <ip> is the IP address of the computer on which VVEngine is running (for example http://192.168.1.100:8001). See http://www.tgrmn.com/web/kb/item54.htm for more information. VVEngine saves its settings and the profile list in a file called VVEngine.xml This file is kept in the folder c:\Documents and Settings\<account>\Application Data\VVEngine (where <account> is the account name running VVEngine). If you install VVEngine as a service under a different account and you want to maintain the profile list, you will need to copy this file from the old account location to the new account location. Services do not have access to mapped network drives: use UNC paths in the ViceVersa profile settings if you plan to run VVEngine as a Windows Service and need to access the network. The local system account does not have access to the network at all. Use the NetworkService account or a user account with network access if you need to access the network. If a password to access the network is needed, enter it in profile settings -> folders -> network in the ViceVersa profile. If the password to access the network expires or changes, it needs to be re-entered. If the account password for the account running the VVEngine service is changed or expires the VVEngine service will stop working. An event is logged in the Windows Event Log. You'll need to re-enter the password in the service properties. Best practice is to use a dedicated account to run the VVEngine service with a password that does not expire. To use Volume Shadow Copies, backup / restore privileges are required (use an account member of the Backup Operators group or Administrators to run the VVEngine service). You can remove VVEngine like any other Windows program. The uninstall procedure will completely and cleanly remove VVEngine from your computer. Click Yes when asked to confirm that you want to uninstall VVEngine. The uninstall procedure will completely and cleanly remove VVEngine from your system. This schedule will run the profile every Monday at 2 PM. From the Windows Taskbar, select "Start" > "All Programs" > "VVEngine for ViceVersa PRO" > "VVEngine Settings". In the VVEngine settings dialog box, enter the access password in the "HTTP Password" field. Click on "Apply Changes". VVEngine will ask you to confirm the password you entered and then restart. VVEngine will now require a password when connecting with a web browser. Yes, you can change the HTTP port used by VVEngine. The default port is 8001. This can be changed if conflicts occur with other applications. From the Windows menu, select "Start" > "All Programs" > "VVEngine for ViceVersa PRO" > "VVEngine Settings". In the VVEngine settings dialog box, enter the new port in the "HTTP Port" field. Click on "Apply Changes". VVEngine will restart. This issue is caused by a new security feature added to Internet Explorer 8. Updating to VVEngine 1.1 Build 07 (or newer) fixes this problem. Keep an eye on VVEngine! The VVEngine Gadget puts VVEngine right on your desktop. You can keep track of what's happening in VVEngine while you work. You can run and check profiles right from your desktop. You can position the gadget anywhere on the screen, move it and resize it as you like. The VVEngine Gadget is available for Windows 7, Vista or newer. It requires VVEngine 2.0 or newer to be installed. NEW: Real-Time, Super-Fast, No Rescanning Execution. Monitor source and/or target folders for changes at file or subfolder level, and then backup, synchronize, replicate files without folder rescanning. Essential over slow connections and for real-time execution with a large amount of files. Plus VVEngine keeps track of all the changes happening so they can be reviewed. In the standard backup / replication / synchronization routine, Source and Target folders are analyzed to look for file changes. The folders are scanned, their content is compared file-by-file and a list of file changes is built based on timestamps and/or size. Then the new files, or the files that have changed, are copied or deleted, as needed. Handling a large amount of files. If backup, replication or synchronization must be real-time or as fast as possible. For improving performance in the above situations, VVEngine 2.1 now offers some new capabilities which are described below. The first time the profile runs, source and target folders are fully scanned and analyzed. However, after the first run VVEngine no longer scans source and target. Instead, it monitors source and target and keeps track of all file changes. Then, when the profile runs, VVEngine and ViceVersa use this information to apply the changes without the need to re-analyze the entire file set. This means that the total amount of files to backup, replicate or synchronize is no longer a factor, as changes are detected in “real-time”. Plus all of this happens without using extra computer resources: the file monitoring relies entirely on the standard Windows functionality and does not need any new file system driver or special service to be installed. Full Rescan: When a file change is detected, a profile run is initiated. The source and target folders are fully rescanned to find out which files have changed since the last run. This is the standard change detection functionality: source and target are fully rescanned on change detection. Subfolder Level: Changes are detected and tracked at subfolder level. When a file change is detected, a profile run is initiated. However only the sub-folders where the file changes have occurred are rescanned which significantly improves performance. This is part of the new real-time capability of VVEngine. File Level: Changes are detected and tracked at file level. When a file change is detected, a profile run is initiated. However only the files with changes are rescanned. This speeds up the profile execution significantly. This is part of the new real-time capability of VVEngine. The new Subfolder Level and File Level monitoring do not require full rescanning of source or target like Full Rescan. This speeds up execution substantially especially over slow connections or when dealing with a large amount of files. The difference between Subfolder Level and File Level is that File Level monitoring is more detailed, detecting changes at file level instead of just at subfolder level. However, because of the level of detail, it may result in more Overflow situations. Overflow situations force a full rescan if some changes are missed. For most applications, Subfolder Level monitoring will suffice. Note: Subfolder Level and File Level detection options are only available in the VVEngine Server Premium edition or in VVEngine for Windows 10, 8, 7, Vista, XP, 2000. They are not available in the VVEngine Server edition. An easy way to monitor all ViceVersa and VVEngine profiles that are running on multiple servers from a single central server, is to use the Windows Server Manager. Just add all the servers that need monitoring to the Server Manager on the main server and once that is done all VVEngine profiles running locally or remotely can be monitored from there. VVEngine logs all profile failure events in the Windows Application Log. These events can be shown in the Server Manager, collected from multiple servers. If an error with a profile that is running on a remote VVEngine is detected, it is then possible for the server admin to connect to that specific VVEngine to see all the details with a Web Browser, using IP address plus the VVEngine port. Also if VVEngine is setup to run as a service, then any service failure with starting/stopping can be monitored locally and remotely via the Server Manager. There are also other ways to report failures. For instance, an e-mail can be sent by each profile in case of profile failure to a specific e-mail address. E-Mail notifications are set in the profile settings. 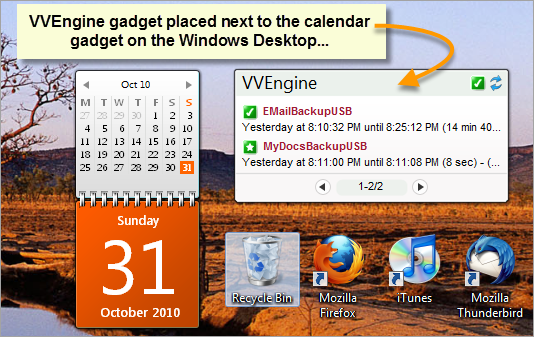 The VVEngine Gadget puts VVEngine right on your desktop! System Requirements: Windows 7 or Windows Vista with VVEngine 2.0 or newer. How to Install: Download the gadget and open the file. If you save the file first, go to the location where the file is saved and double-click on the file to install. How to Setup: Once installed, the gadget will self-configure and get profile information from VVEngine. Optionally, gadget options can be set. Description: Keep an eye on VVEngine! Keep track of your profiles while you work. 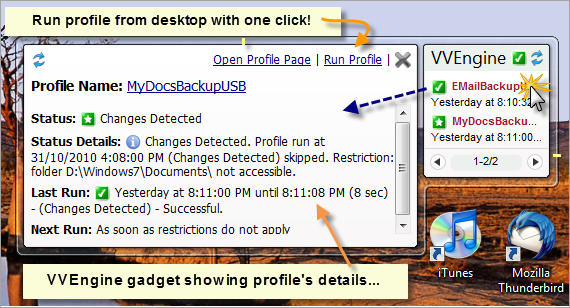 Run and check a profile right from your desktop. Position the gadget anywhere on the screen, move it and resize it as you like. VVEngine is not running. The VVEngine icon on the taskbar is gray or not present. Solution: Start VVEngine: Start -> All Programs -> VVEngine for ViceVersa PRO -> VVEngine Home. To show the VVEngine icon on the taskbar select: Start -> All Programs -> VVEngine for ViceVersa PRO -> Show Icon on Taskbar. VVEngine is running, but on a different address. Solution: Open the VVEngine Home: Start -> All Programs -> VVEngine for ViceVersa PRO -> VVEngine Home. Check the VVEngine address in the browser address bar, then copy the address into the gadget options. VVEngine is running, but on a different computer. Solution: Enter the remote VVEngine address in the gadget options. Make sure the firewall allows the HTTP protocol over the HTTP port used by VVEngine on the remote computer. The port is shown in the VVEngine address, in the browser address bar and in the VVEngine log. Make also sure that the remote VVEngine allows connections from the IP address of the computer where the gadget is running: check the VVEngine Settings section in the VVEngine help file. Solution: If a VVEngine password is set, use the option "Allow Access to VVEngine Read-Only Pages without Password". This option grants read-only access to the gadget. For more info, refer to the VVEngine Main Settings section in the VVEngine help file. To change gadget options, right click on the VVEngine Gadget and select Options. VVEngine address: This is the VVEngine address where the gadget gets the profile information from. The default address is http://127.0.0.1:8001: this is the standard address when VVEngine is running on the local machine. 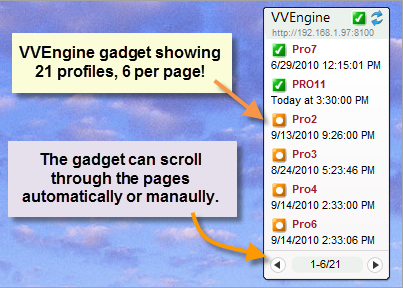 Profiles per page: Number of profiles per page to be displayed in the VVEngine gadget. Auto-scroll: Sets the gadget to automatically scroll through pages if necessary. 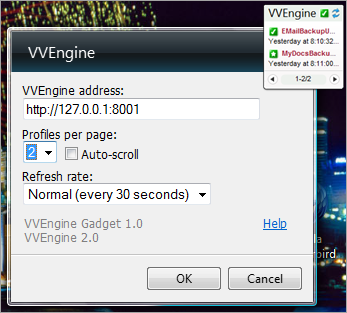 Refresh rate: How often the gadget refreshes and gets updated profile information from VVEngine. Size: Sets the gadget width / size on your desktop. Always on top: Keeps the gadget always on top of all other open windows so it's always visible. Opacity: Sets to what degree the gadget is visible. 100% opacity sets the gadget to completely visible. 20% opacity sets the gadget to almost completely transparent.